I’m not sure how well this film did at the box office. My recollection is that it got mixed reviews and probably didn’t make a whole lot of money, at least not in theatres. My guess, though, is that the financiers will get their money back in the long run after foreign rights and DVD sales. I hope they do. We need more smart films like this one. This film appealed to me for a variety of reasons. One, it involves what many consider to be a wrongful conviction. This site is full of wrongful conviction stories. Secondly, I’ve been interested in the Lincoln Assassination since reading the book Manhunt, which involves the hunt for John Wilkes Booth after the assassination. In fact, when I first heard about this film that’s what I thought it was about. This film is primarily about two characters, Mary Surratt, played expertly by Robin Wright and the attorney who defends her Frederick Aiken, played by James McAvoy. There are many similarities between this story and some more recent events such as the use of military tribunals, rush to judgement, and media hype such as that surrounding the Casey Anthony trial. In the case of Mary Surratt, we’re talking about a rush to judgement that took only three months from the alleged conspiracy to her eventual hanging. And I’m not giving away the plot. 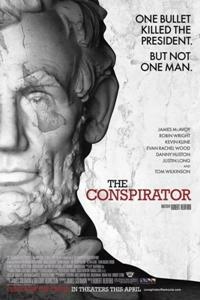 Most people who see this film will know beforehand that Mary Surratt was the first woman hanged. The question considered in the film is did she receive a fair trial and did she deserve her sentence? The answer to both of these questions, in my opinion, is that she did not. This is a period piece that takes place in 1865. So that means no electricity. This results in a dimly lit film, but the natural lighting adds a level of authenticity. Throw in period wardrobes and a few special effects, like a shot of the White House surrounded by farm fields, and the overall affect is convincing. Making a movie like this involves some risk. But I believe that there are enough people like me who would rather see fact based films over sepcial effect extravaganzas and super hero garbage, commic book junk, TV rehashes, and the third and fourth remake of the same film. The DVD was full of extra material including a making of mini documentary, audio and video commentary from director Robert Redford, and a 67 minute documentary related to the actual people and trial. The documentary included many scenes from the film, leading me to believe that it was done by the same film company – The American Film Company. If that is the case, I am now a fan of the American Film Company. I havevn’t seen this level of detail since viewing the miniseries The Pacific. I’m a fan of Robert Redford. I hope to be still working on creative projects when I turn 75. I found his audio commentary to be insightful, but I’m not sure if having video of him giving the audio commentary added anything. I spent a lot of time watching Robert Redford watching his movie and taking sips from his water bottle.